How do you create a beautiful night to remember for everyone, and most importantly yourself? We here at Ah, Whatta' Bout Mimi have come up with a few different ways to take away stress from the bride and groom as they prepare for one of the most important journeys in their lives, marriage. Let us take the pain and stress out of making sure your wedding reception goes smoothly and is all set up. We not only put together decor for the tables, dance floor, and important areas, we also do candy buffets (the new "must have" item for weddings). It's simple. All you need to do is tell us your color scheme, a budget, and an overall idea of what you are looking for decoration-wise. We can then put together a sample presentation for you. This will include some sample pictures or the items themselves for decoration, as well as candy sampling for the buffet. Creating your dream come true is all what we are about! The finished table with fabric swag across the front. In a wedding we just completed, we not only created an amazing dance floor decor, we put together a candy buffet and decorated all the important tables (cake table, gift table, AND the alter). It's so much fun putting together all these beautiful things, and we always love a challenge. To start off the description, I am going to start with the candy buffet, because that is what I am in charge of myself. First I research candy in that colors from our suppliers. Then I put together a sample list including quantities according to your colors and number of guests. If you haven't had our candy before, we have the highest quality chocolate available and many colors and type s available for your buffet. Some choices are the delicious candy coated Dazzle Almonds. 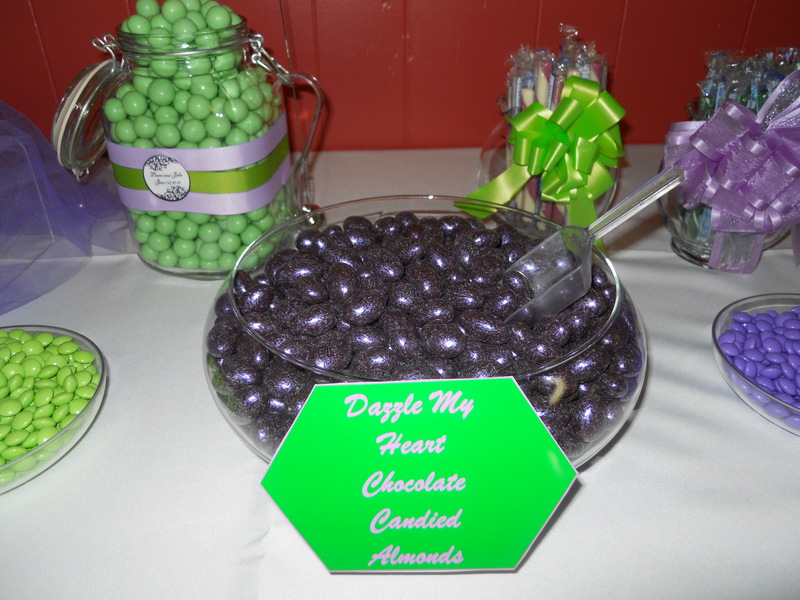 These are a candy coated almond available in a wide variety of colors and have a sparkle to them that makes them a perfect addition to any buffet. Once we have the candies picked out I start to come up with fun names for each item to be displayed along side each candy. As you can see, this is where I get to be creative! If you have a certain theme, I will of course stick to that, or come up with one of my own. The signs can also bear descriptions of each candy, depending on how specific you want to be. For example, when I did the 100 year old candy last year (if you remember I blogged about it), I put a description of each candy underneath the title. Choosing the proper containers for each item is essential. As you can see below, I like to adorn each container with some type of ribbon or bow. This can create different layers and add to the eye-catching appeal of the buffet. To the left, I have key lime cookie bites in an old fashioned cookie jar. This is just one way I like to stay creative while adding to the atmosphere and uniqueness of each buffet that I put together. Ordering customized stickers is something I strongly suggest to clients. 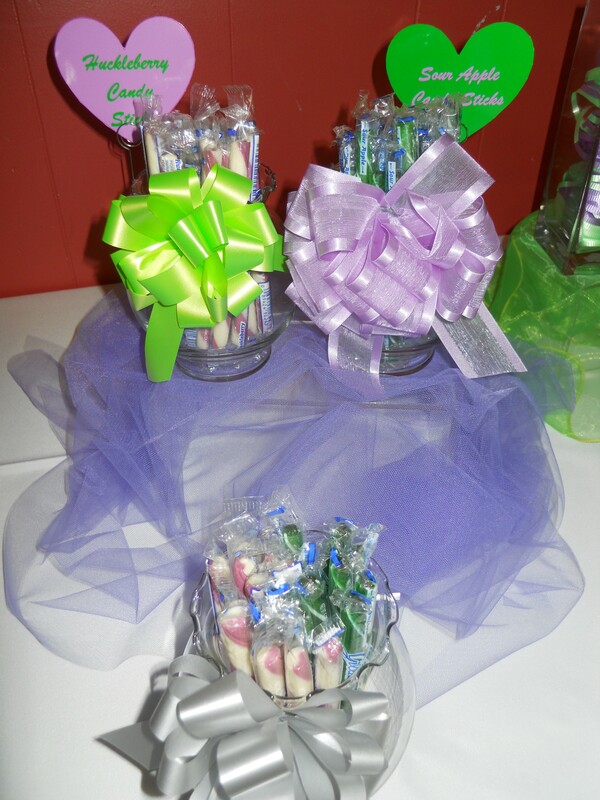 They work perfectly on the small plastic bags that double as the guests' keepsakes and the extras can be added to the jars of candy. They also work on the mini Chinese take-out containers or small boxes. The type of container you choose depends on your style and your budget, but with Mimi's team you don't need to worry about ordering things or putting them together; that's all taken care of for you, by us. Again it all depends on the look that you are going for and how much you want to spend; you can do a lot on a small or large budget. The way the green snakes through the purple gives it the accent of color without too much distraction. The next step is of course the centerpiece for your buffet. For this wedding's buffet we did a giant suspended heart made of air-filled balloons in their colors. This heart was beautiful and not only completed the buffet, but added to the overall decoration of the event. This is just one way of doing your centerpiece. 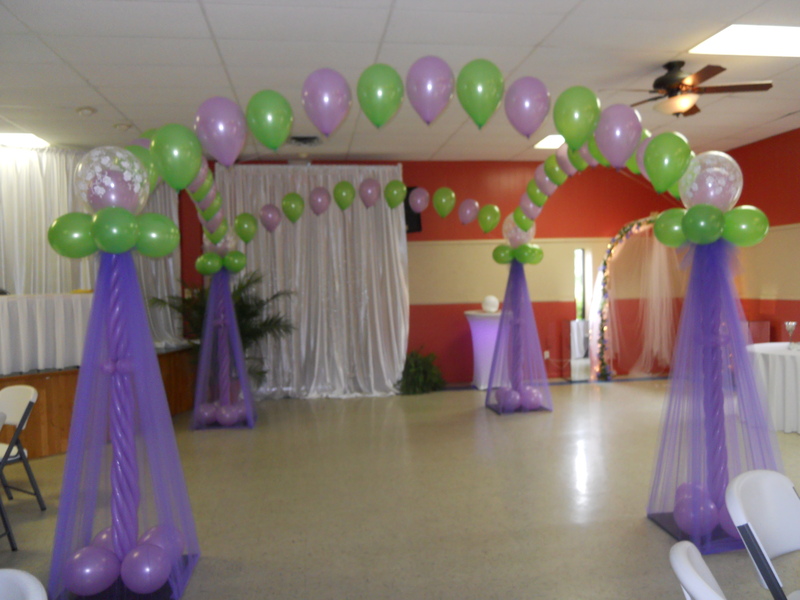 We have also done balloon arches over the table or actual centerpieces on the table, of either flowers, balowers (balloon flowers), or faux candy. While all this might seem overwhelming, have no fear Mimi's team is here to calm all your nerves and take all the stress off your shoulders. Your wedding day is a day of celebration and fun, not worry and anxiety. 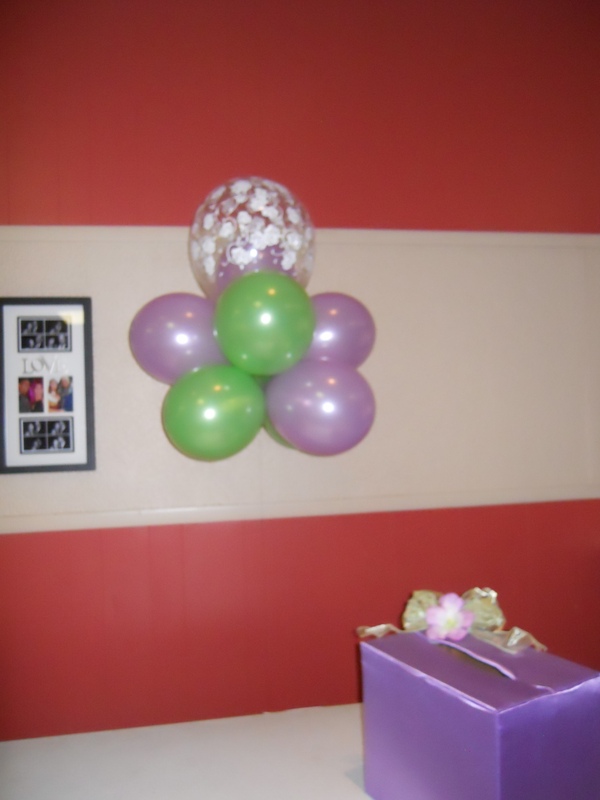 The rest of the decorations were simple and so much fun to put together. It included a mixture of balloons, tulle, and of course character. The dance floor was "fenced" off with a fun four column archway. 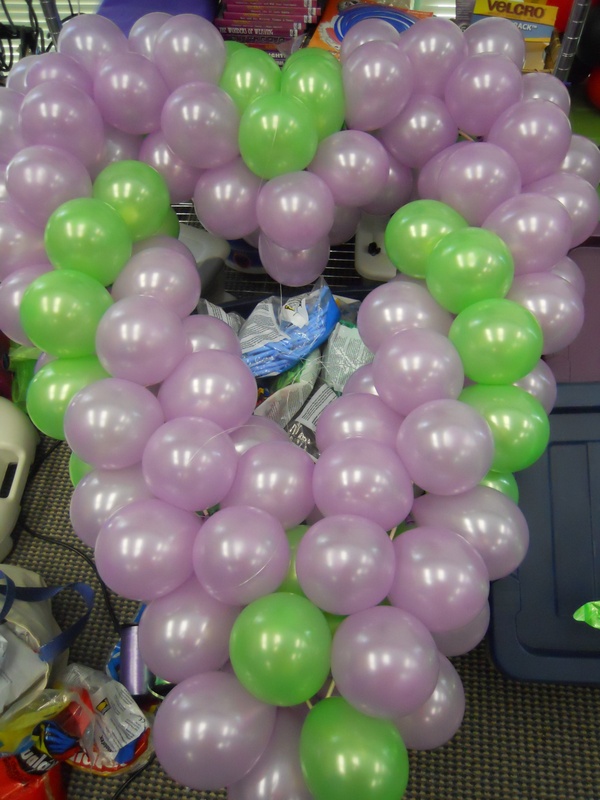 We wrapped balloons around four mini poles and then attached helium arches to the top, which created a beautiful look. 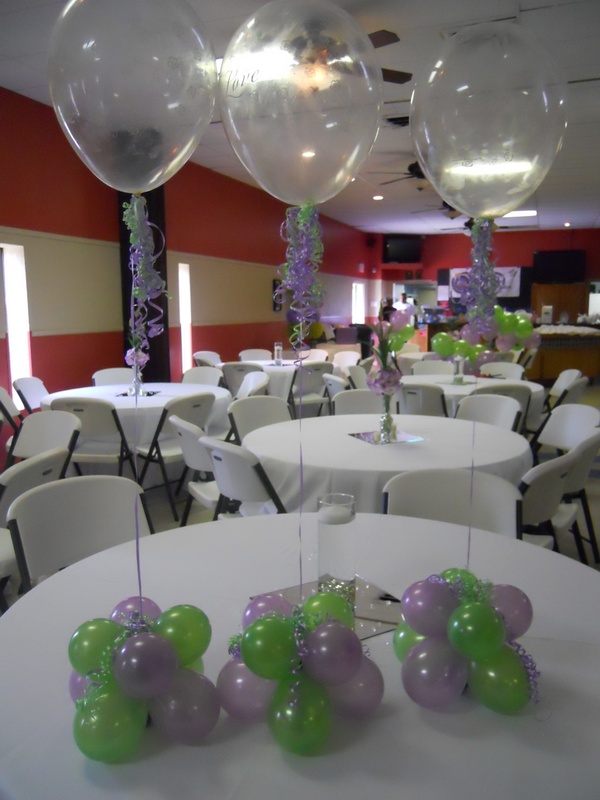 The table tops had different balloon centerpieces and faux floral and vase centerpieces. We mixed and matched to keep prices down, while still creating an enchanted look. Using fake flowers can keep prices down while also lasting forever. You can choose to let guests take them home as souvenirs or use them in your own household. Mirrors and candles are also something that are very popular right now, the only thing to check is whether or not you can have actual candles or if you need fake ones. 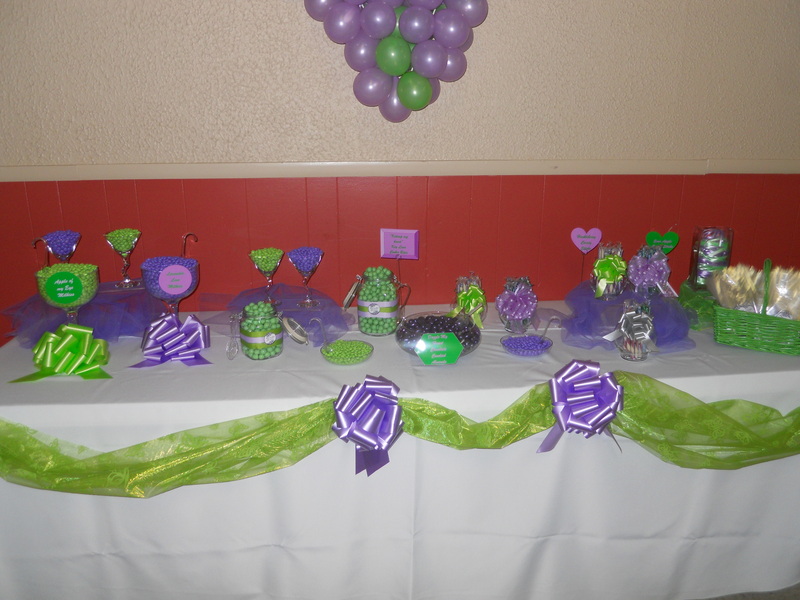 Whether you have a wishing well, cake table, or alter to decorate, we can also come up with unique designs for each table. No one ever said that you needed to have everything identical. So show your unique side and vary your decorations. For the wishing well table we created a floating topiary balloon that floated above, like the cloud of wishes for the newlyweds. 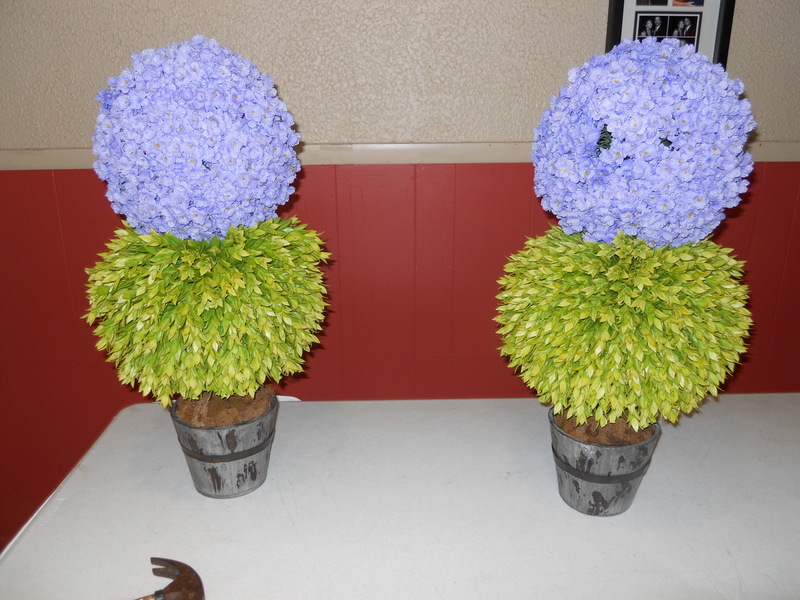 This topiary matched the bases of the table-top balloon centerpieces we created, and was an added eye-catcher, too. It was a lot of fun to create and match the decor. Notice how both sets of balloons are similar but don't match? This creates a nice ambiance while not being overly repetitive. 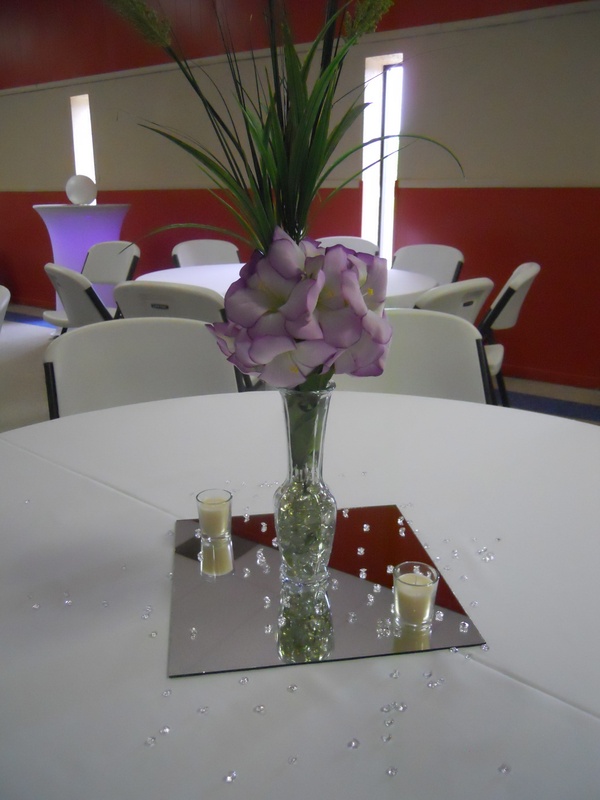 As you can see, we love creating beautiful works of art for your special day. Whether you are hosting a large reception or just a small get-together, let us help make it beautiful and much less stressful for you and everyone involved. Let us know what you think!! And give us a call at 502-583-4933 for all your party needs!